I love to have snacks like these on hand for a quick pick-me-up or even as a stand-in for breakfast in a pinch. They are super easy to make. 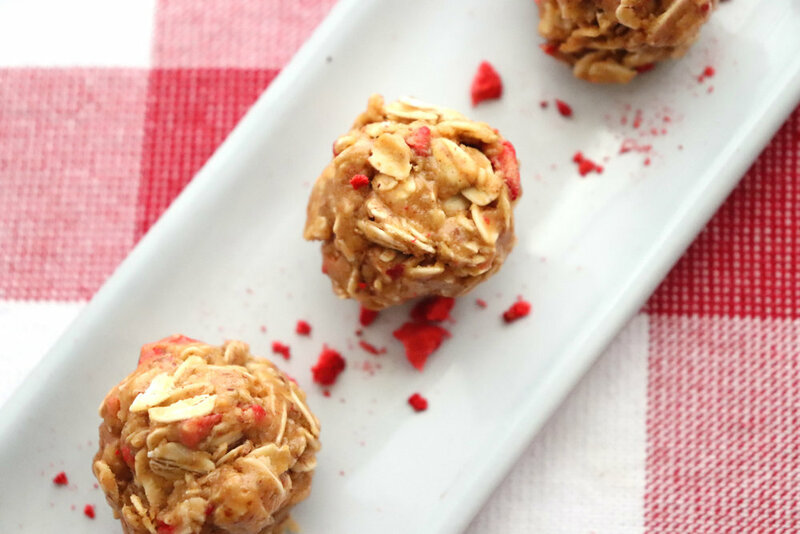 Just stir all the ingredients together, chill for about 30 minutes and then form into bite-size balls. Recreating my favorite childhood sandwich (and sometimes even these days! 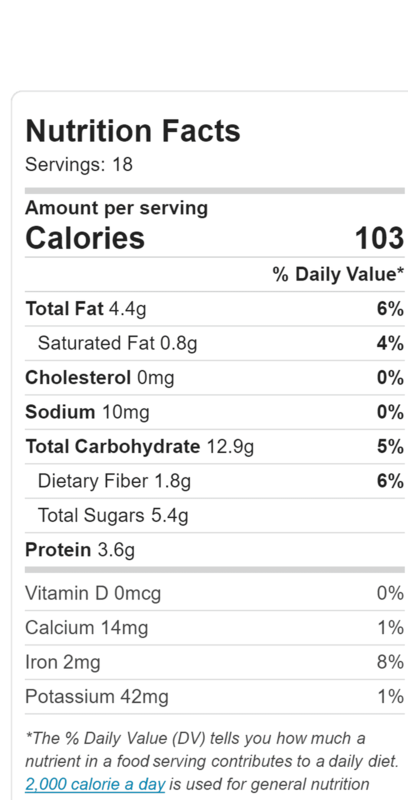 ), peanut butter and jelly, the "jelly" part of these energy balls comes from freeze-dried fruit. Most dried fruits have added sugar, but freeze-dried are just the fruit itself, with absolutely no moisture. You can eat them alone as a snack, mix with nuts or cereal for a trail mix or use in recipes. 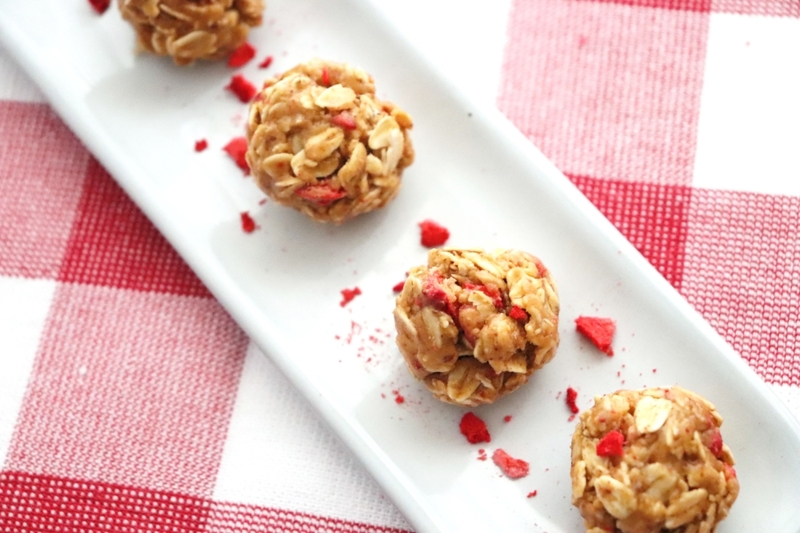 They work perfectly in these energy balls, softening slightly but staying intact. I used freeze-dried strawberries but I've seen all types of freeze-dried fruit in the stores. You can use any nut butter for this recipe. Peanut butter is always my go-to but almond or cashew butter would also be tasty. If you use a more traditional peanut butter you may need to increase the amount slightly or add a little more honey for the mixture to stick together. I used natural peanut butter that you have to mix together before using. I like to keep these in the refrigerator or freezer and just pop a few out when I'm headed out the door. 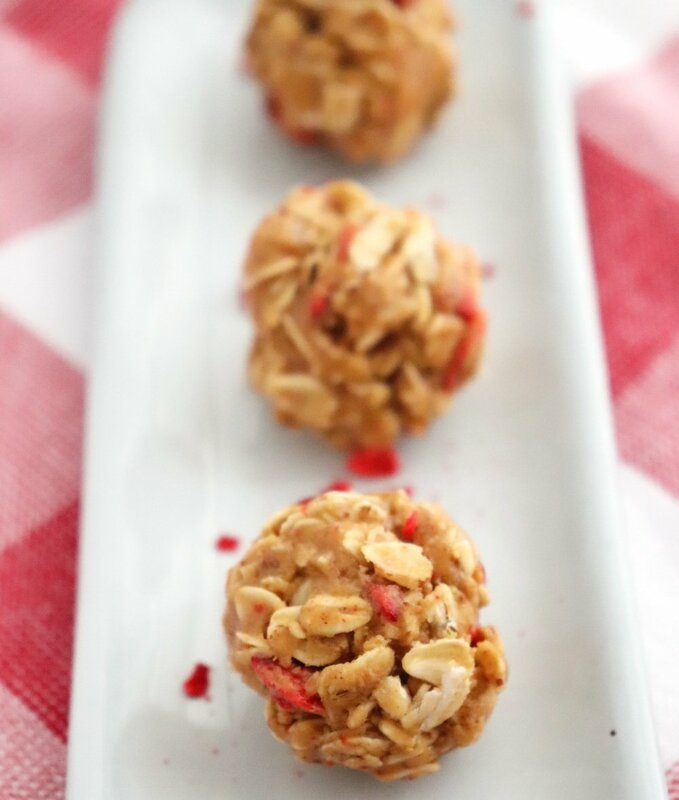 A perfect little snack for a quick burst of energy! Place all the ingredients in a large bowl. Stir to combine. If the mixture seems too wet, add more oats. If it is too dry and crumbling, add more peanut butter or honey. It should stick together when you roll it into a ball. Refrigerate for 30 minutes and then portion the dough into balls. Store leftover balls in an airtight container in the refrigerator for up to 2 weeks or freeze for up to 3 months.